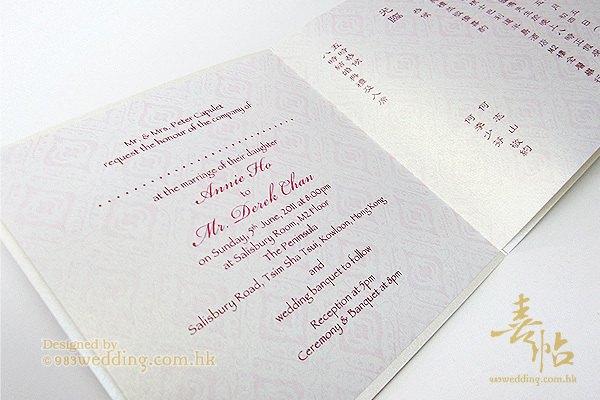 Mandarin duck patterns are extensively used when it comes to a Chinese wedding. You can see them no matter they are the wedding decorations, wedding favors, invitations and so on. Usually, they will come in a pair. Of course, this is not difficult to understand. 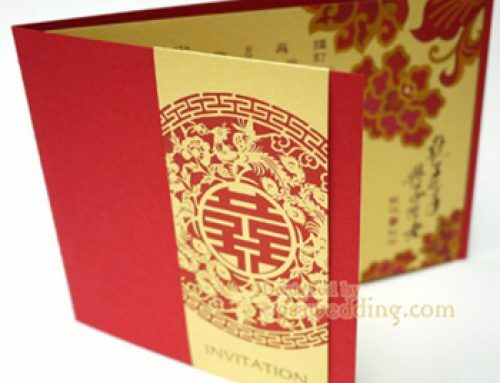 A Chinese wedding is always about blessing and good fortune. A pair of mandarin ducks will be together. The bride and groom who are going to get married will also be together for the rest of the lift. This wedding card design is not something very complicated. 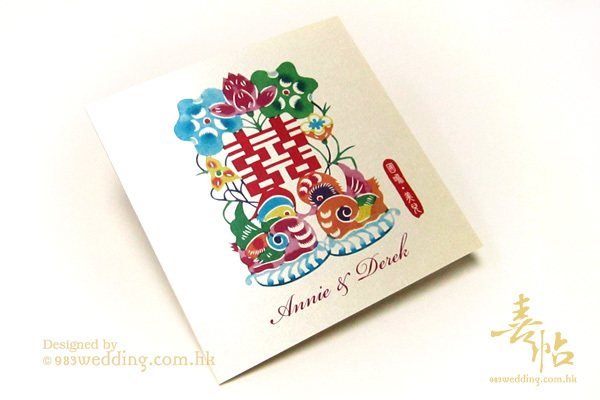 A beautiful paper cutting pattern of mandarin ducks are printed on the cover. This pattern is a very colorful and eye-catching one. 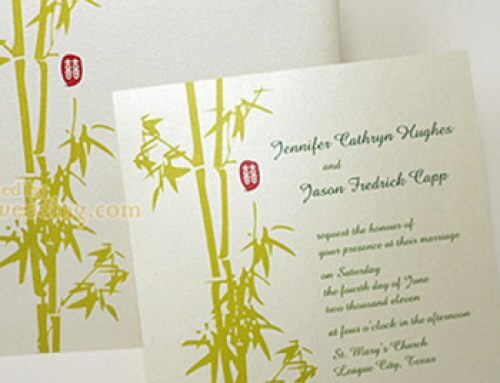 The names of the couple are also printed on the cover of this design. Here, we attempt to create a Chinese design without using red color. This is not the first time we do this. 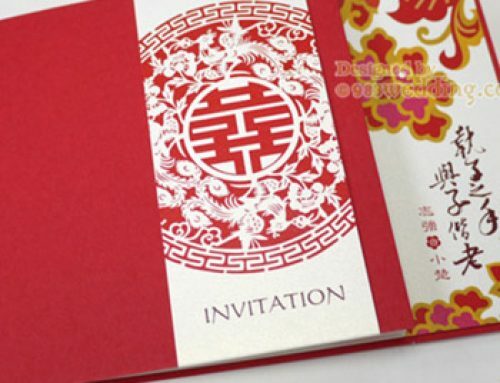 However, we will say that it is one of the methods to create a modern Chinese design. In fact, a lot of brides and grooms would like to go for this option. 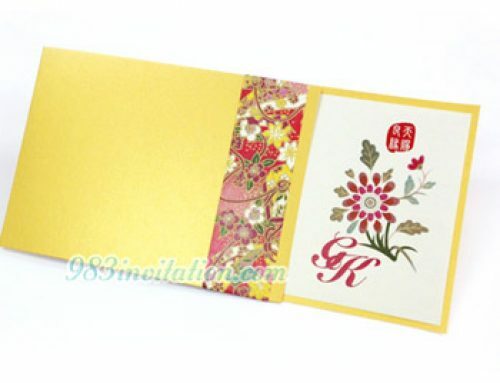 This is because most couples would like to have a modern Chinese wedding card. This design is just a perfect option. In fact, the pair of mandarin ducks is only one of the graphical elements you will see in the paper cutting pattern. The pattern actually comprises three different graphical elements. They are mandarin ducks (of course), double happiness and lotus. These three elements are of various meanings. As mentioned, the pair of mandarin ducks means that the couple will be together for their lifetime. The double happiness reminds us the wedding of the couple. And the lotus implies the notion of fertility. It will also be a good idea to stress the names of the couple. Both the English and Chinese names of them are printed on the cover. The English names are printed underneath the pattern while the Chinese names are printed on the right-hand side of the pattern. The Chinese names are treated in a way that it will look like a chop. This chop is red in color. It looks traditional. 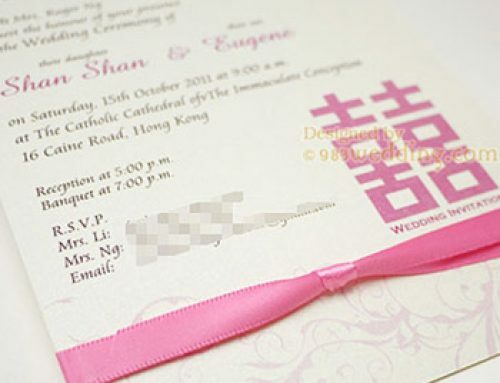 Couples usually love to have their names emphasized in this way on the invitation cover. Both the cover and insert are pearl in color. A simple pattern is printed on the insert, as a background, to make it richer.